Open the eMule Preferences/Files dialog and specify VideoLAN client as the video player which is to be used for previewing part files. The purpose of this access module is to provide VideoLAN a media stream out of an eMule part file. Because an eMule part file usually does not contain a complete media stream, the VideoLAN software has to scan the entire file to find all actually available data. The process of scanning the entire file may take a rather long time, depending on the actual data available and the file size. This access module will evaluate the eMule part.met file of the corresponding part file to know which file data is actually available. With this information the access module is capable of creating a virtual media stream without any gaps and will feed this media stream right into VideoLAN. VideoLAN will no longer need to scan the entire file, because it "sees" only the really available data of the part file. IMPORTANT NOTE: After installing the eMule part file access plugin or after installing a new version of VLC you should always manually check if the version of the eMule part file access plugin matches the version of VLC. This is because VLC does not support plugins which were developed for a different version of VLC than the installed one. This means, if you are using e.g. VLC v0.6.1 you can not use an eMule part file access plugin which was developed for e,g. VLC v0.6.2 and vice versa. This means further, the version of VLC does always have to match the version of the eMule part file access plugin. There is no way to check this automatically, therefore you have to manually open the VLC Settings dialog (Settings/Preferences/Plugins/access) and check whether there is an access_partfile module available. If not, your version of VLC does not match the version of the eMule part file access module. Either upgrade the VLC or the eMule part file access module. The part file access module will automatically be invoked by VideoLAN client every time a file is opened. If the extension of the opened file is .part, the access module tries to find the according .part.met file and will then handle the part file in the above described way. This means, that there is no special action to be taken to use the functionality of that access module. Just open any part file you want to view. Either from within eMule (Preview) or from within Windows Explorer or with File Open dialog from VideoLAN client. Additionally you can specify the part file to be opened with partfile://<path> to make sure that part files are opened with the part access plugin when opening a part file from the VLC open dialog or the Windows Explorer command line (will prevent VLC's automatic detection). The settings dialog page for the access module is available within VideoLAN client at Settings/Preferences/Plugins/access/access_partfile. Normally eMule's preview is not seek able, i.e. you cannot skip around in the movie or use a slider or jump to a given position. Enabling this options will create seek able streams allowing this. The decision if a part.met file is an AVI or a MPEG file is made upon the file extension and other meta information eMule provides. As this information is not always 100% correct it may happen that a seek able stream is created although the corresponding option is not enabled (e.g. you are downloading a file "My vacation video.mpg", but the actual format of the file is of type AVI). Should this occur you may want to rename the file to its proper extension in eMule's File Details dialog. If this option is enabled, the part file access module will provide the virtual media stream built from the part file only if the part file contains an MPEG file. Default = enabled. If this option is enabled, the part file access module will provide the virtual media stream built from the part file as a seek able stream. This option has no effect, if the "Enable plugin for MPEG part files" option is disabled. Default = enabled. If this option is enabled, the part file access module will provide the virtual media stream built from the part file only if the part file contains an AVI file. Default = disabled. If this option is enabled, the part file access module will provide the virtual media stream built from the part file as a seek able stream. This option has no effect, if the "Enable plugin for AVI part files" option is disabled. Default = disabled. Note: Seek able streams for AVI part files may give false results (media stream is stopped too early) and/or slightly poor performance compared to MPEG seek able streams. 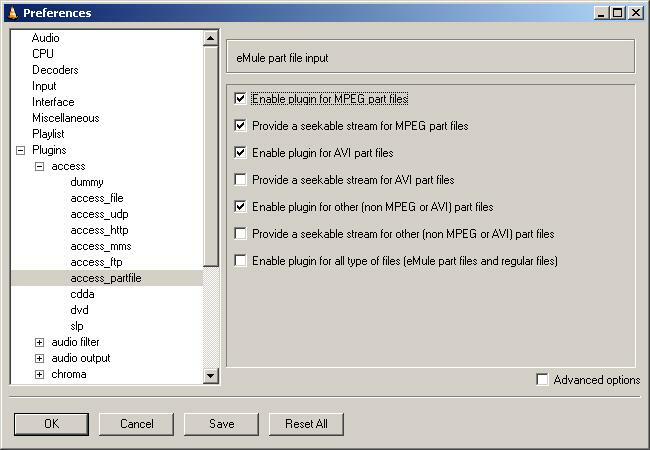 If this option is enabled, the part file access module will provide the virtual media stream built from the part file only if the part file does not contain an MPEG file or an AVI file. Use this option to preview any other file types (e.g. OGM, MKV, ...) Default = disabled. If this option is enabled, the part file access module will provide the virtual media stream built from the part file as a seek able stream. This option has no effect, if the "Enable plugin for other (non MPEG or AVI) part files" option is disabled. Default = disabled. If this option is enabled, the part file access module will handle all file types which are opened by VideoLAN client and which would otherwise be handled by the VideoLAN client's default file access module. Enabling this option may be of interest to get around a bug in VideoLAN client's file access module which sometimes freezes the entire system when reading broken media files. The eMule partfile access module tries to get around this bug and handle the non part file in the same way as the original file access module. Default = disabled. The file information dialog is available within VideoLAN client at View/File info and shows the file format parameters determined by VideoLAN and some of the eMule/ED2K meta data.